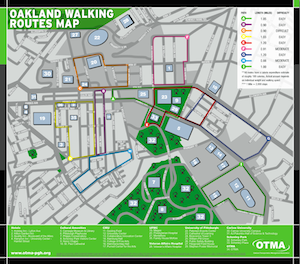 Download this map showing walking routes in Oakland. The map includes nine walking routes, identifying each route based on level of difficulty. Each route takes you through various parts of the Oakland neighborhood including the business district, institutional campuses, cultural/historical areas, residential areas, and parks. Also identified on the map are hotels, cultural amenities, and the institutional campuses of University of Pittsburgh, Carnegie Mellon University, Carlow University, and UPMC.